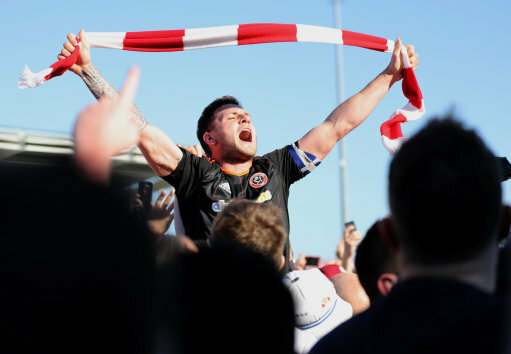 Chris Wilder's Sheffield United required only a victory to secure automatic promotion. Had they lost then they would have had to match Fleetwood's result at Oldham. Whilst the Cod Army lost 2-0 at Boundary Park, thank fully United didn't need to rely on this result after winning their own match in dramatic fashion. Bolton also failed to win their match at Scunthorpe, giving United a 9 point gap at the top of the table. United squandered earlier opportunities to take the lead and were punished in the first minute of first half stoppage time as Marc Richards burst the net. The second half saw Wilder make dramatic changes and was rewarded with an equaliser on the hour mark through Leon Clarke. With the clock ticking down John Fleck finished from close range two minutes from time to seal the victory. The Blades took a full allocation of 1,456 plus a further 6,000 watched the beamback at Bramall Lane - with both stadiums enduring a pitch invasion at the sound of full time. Prior to the match, Wilder made changes to the squad which had won at home to Coventry City days earlier. Carruthers, O'Shea and Clarke were all handed a place in the starting XI with Duffy, Hanson and Sharp making way. Clarke started the game up top of his own and was supported by Carruthers in midfield. United made a bright start to the match and could have taken an early lead. Carruthers started a move which ended with him smacking a half-volley from the edge of the area onto the bar, whilst O'Shea fired wide and Coutts acrobatic volley flew over the top. At the other end, Richards latched onto a cross in the centre of the box but his timed volley sailed over the stand. Anderson hit one from distance but failed to hit the target. With half an hour past the hosts went close again when Smith was put through and Moore reacted quickly to make a one-handed save. Chances slowed down as the first half drew to a close, but the game would take a dramatic twist. Fleck tried to catch keeper Smith out at his near post with an angled free-kick but in the one (and only) minute of injury time added on, United were caught out on the break following a sloppy pass from Clarke. Smith lay off RICHARDS and from a difficult angle blasted the ball into the far top corner. Changes were made at the break with Sharp replacing Carruthers. Five minutes in a Fleck corner saw O'Connell aim his effort at goal, but Smith reacted well to keep the Blades at bay. Hanson replaced O'Shea as United searched to get back into the game. It looked like it was going to be 'one of those days.. .’ with nothing going United's way in front of goal until the hour mark passed. Fleck fed the ball through the defence and CLARKE kept onside and fired past Smith in front of a jubilant United supporters. It was one way traffic from there on and United we unfortunate not to find a second goal in quick succession. Smith was on form as he flew across goal to keep out Basham's header from Coutts corner. Smith then reacted well to stop Sharp's deflected effort from finding the net. Clarke then headed Lafferty's cross over the bar. With 15 minutes remaining, Fleck beat his marker but the ball was scurried away by Smith. Wilder made his final change of the day with Ebanks-Landell replacing Clarke. Both sides looked content to wind the clock down, 1-1 would have been enough to secure promotion but there would be further drama with two minutes remaining. Sharp charged down the right-flank and pulled the ball back for FLECK who poked home from close range to celebrate in a wave of a red and white pitch invasion. There would be a further invasion at the sound of the final whistle but the previous hold up added five minutes of stoppage time onto the 90. Theese minutes went without incident and the referee blew his whistle to sound United's promotion back to the Championship for the first time in 6 long years. Northampton Town: Smith, Moloney, Buchanan, P. Anderson (McWilliams 70), Diamond, Richards, O'Toole, Nyatanga, Smith (Revell 70), Taylor, Williams (McDonald 81). Unused: K. Anderson, McCourt, Phillips, Cornell. Sheffield United: Moore, Fleck, O'Connell, Basham, Wright, Coutts, Freeman, Lafferty, O'Shea (Hanson 53), Clarke (Ebanks-Landell 82), Carruthers (Sharp 45). Unused: Long, Done, Duffy, Chapman.